Slide chute is 5.5ft long. The Qwikfold Big Slide brings the playground to your home. Get your kids laughing and playing outside on this colourful green slide. Enjoy hours of play with this 5.5 foot long slide. The rounded corners in moulded plastic make sure that your kids have a smooth slide, while the high sides of the chute make sure that children stay safe as they play on the slide. The top of the slide features large handles in moulded plastic that are designed to be easy to grip. The cut out shapes in the handles are perfect for little hands to hold as they climb. 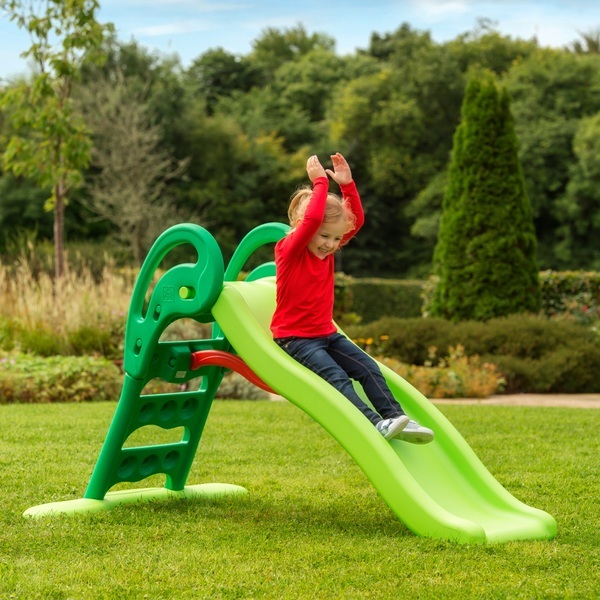 The three wide green steps of the Qwikfold Big Slide are designed to make sure that kids stay safe and well balanced when climbing to the top of the slide. Plus they’re shaped like shoes! Or are they clouds? This slide features a wide base and a red support bar to provide greater stability during outdoor fun. As well as being easy to assemble, the Qwikfold Big Slide features an easy fold for compact and convenient storage. This makes it eas to tidy away and perfect for gardens without a lot of free space. It’s suitable for both indoor and outdoor use.